In the New York Times bestselling book Ship of Fools: How a Selfish Ruling Class is Bringing America to the Brink of Revolution, author Tucker Carlson reveals the truth about the new American elites. They are a group of individuals whose wealth and power has grown beyond imagination. They amass this wealth as the rest of the country continues to wither. The people who are running America now barely interacts with the rest of the country. They usually fly on their private planes, watch sporting events far from the stands in skyboxes, and ski on their own mountains. They also have total contempt for you. Carlson writes, “They view America the way a private equity firm sizes up an aging conglomerate, as something outdated they can profit from. When it fails, they’re gone.” In the book Ship of Fools, Tucker Carlson offers a real blistering critique of the new overlords of America. 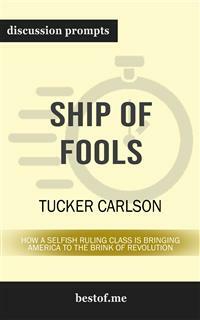 In this comprehensive look into Ship of Fools: How a Selfish Ruling Class Is Bringing America to the Brink of Revolution by Tucker Carlson, you'll gain insight with this essential resource as a guide to aid your discussions. Be prepared to lead with the following: Discussion aid which includes a wealth of prompts and information Overall plot synopsis and author biography Thought-provoking discussion questions for a deeper examination Creative exercises to foster alternate “if this was you” discussions And more! Disclaimer: This is a companion guide based on the work Ship of Fools: How a Selfish Ruling Class Is Bringing America to the Brink of Revolution by Tucker Carlson and is not affiliated to the original work or author in any way. It does not contain any text of the original work. If you haven’t purchased the original work, we encourage you to do so first. Have you ever wanted to improve your understanding of Ship of Fools? Or perhaps you are simply struggling to learn the subject matter? It’s a simple teaching technique that helps students learn and readers to grow. With versatile discussion questions for each major criteria regarding Ship of Fools, these discussion prompts are designed to help surface crucial discussions that are capable to assist toward thinking and learning on a deeper level.